Technical specifications of SpeedCAM speed enforcement camera - ARH Inc. 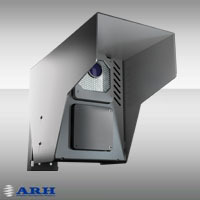 The built in software intelligence and hardware modules are based on ARH's 20 years experience in the field of OCR and ANPR camera technology. The integrated high-power IR illuminator lets the license plates clearly seen without any disturbance of the driver. The integrated speed measurement device (Doppler Radar) can detect cars up to 250km/h. Installation height Over head: 5m typ.